Tuscany is one of Italy’s richest and most diverse regions. While Brunello di Montalcino, Chianti Classico, and, to a lesser extent, Maremma, get most of the attention, Tuscany’s smaller appellations are very much worth taking the time to discover. This article covers new releases from Maremma, Montepulciano, Carmignano and several other smaller districts. Two thousand fifteen could not come around fast enough for producers after the difficult, stressful and costly 2014 vintage. The warm, dry growing season produced generous, highly expressive wines. So far, only the entry-level whites and reds have been released, but it is precisely these wines that give a good indication as to the personality and overall quality of the vintage. The 2015 whites are creamy and rich, yet retain a good bit of freshness. Much the same is true of entry-level reds such as Barco Reale di Carmignano. The more important wines will start to enter the market in the next year or so. Based on what I have tasted so far, all signs point to a high quality vintage. Two thousand fourteen will go down as one of the most challenging vintages in Tuscany. Above average rainfall coupled with the lack of sun and heat during the central months of the summer created significant challenges, not the least of which was a general lack of ripeness and elevated disease pressure. Conditions improved markedly towards the end of the summer, leading into an extended Indian summer with no rain but generally moderate temperatures. With few exceptions, the 2014s are wines of modest depth, complexity and structure. 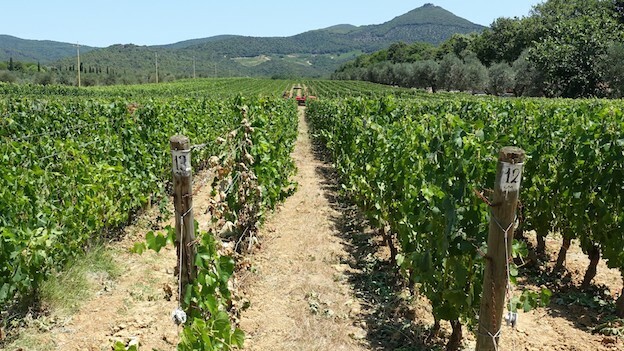 Bolgheri in particular suffers, not so much because of the quality of the wines themselves, but because the wines are stylistically so different from the generous, richly textured style consumers have come to expect from the region’s leading estates. For many producers, the mid-October harvest was the latest on record. Consider that in hot, dry years such as 2011, the harvest can start in mid-August, which means the difference between an early year and a late year can be as much as two months! To be clear, a generation ago, conditions like those of 2014 would have likely resulted in green, vegetal wines. But significant advancements in farming and knowledge gained through past experience have made that much less likely. Readers will have to be especially picky when looking at the 2014s. As was the case during that summer, there are very few bright spots. A few estates are releasing 2013s, a vintage that continues to grow. After the tricky 2012, 2013 presented more consistent conditions. Flowering was late and yields were down at many properties. The summer was mostly positive, with a good bit of heat, but rain during harvest, while localized, did create issues at some estates. The final phase of ripening – always the most critical time of the year – was characterized by strong diurnal shifts and a later than normal harvest. The top 2013s are quite attractive. In general, the 2013s are built on aromatic nuance, freshness and overall delineation, all qualities that will be present in the wines for many years to come. One of the highlights in 2013 is Vino Nobile di Montepulciano, a wine that sadly often gets lost in the shuffle among some of Tuscany’s higher profile reds. That is a shame. Many of the 2013 Vino Nobiles I tasted merit serious consideration. Most estates bottle a Vino Nobile and then a higher-end selection. As is often the case with Brunello di Montalcino and the Brunello Riservas, I often find the straight Vino Nobiles more interesting than the top of the line offerings, especially when taking into account pricing. I tasted all of the wines in this article between July and October 2016.